By now you know that almost anything can be done in your team colors. And that inlcudes Chex' infamous Muddy Buddies(TM). In an attempt to make my LSU loving guests feel more comfortable as their tigers matched up against my tigers, I went ahead and threw in purple and gold M&Ms to make this batch. But you can order any color M&Ms under the sun to mix in and make it perfect for your game day. Trust me, 18 servings isn't going to be enough. Before adding your team colors, it's best to put mix in the fridge over night. Above is the original recipe from Chex. Because why fix what isn't broken? Some days we are Pinterest stars, other days we are store-bought heroes. Tailgating is a labor of love. If you feel up for making your game day fare homemade, I'll be the first one to send you a recipe. If you've had a busy week and just want to relax before the game, I'll head to the store with you to find the crowd favorite pre-mades. Don't make it any harder than it is. Put your store-boughts on a pretty platter and you've already scored a touch down. Candy Apples on a gridiron platter is the easiest sweet I've ever served! There are belles and then there are Gridiron Belles. Gridiron Belles understand the importance of fully participating in game day-- which includes cheering endlessly for your team and a wardrobe that revolves around team colors. We teamed up with a true Gridiron Belle, Kate Lewis, to bring you a chance to enhance your game day attire with an exclusive Gridiron Belles Stella and Dot Trunk Show! And a giveaway, of course! 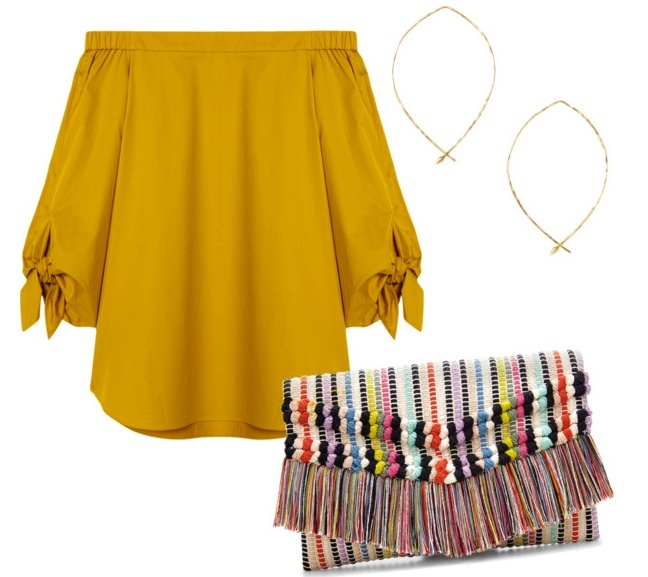 Mix, match and shop here. Don't forget to enter the giveaway by following @GridironBelles and tagging 3 friends who are Gridiron Belles or just really stylish on game days! Winner will be announced on October 29! Tailgate food is essential to an SEC fans' game day. And for some teams, the food is better than the play on game day... so when someone tells us they have a tried and true recipe that they even share with their opponents, we tested! I met Nanette from LSU back in 2011 in Baton Rouge. 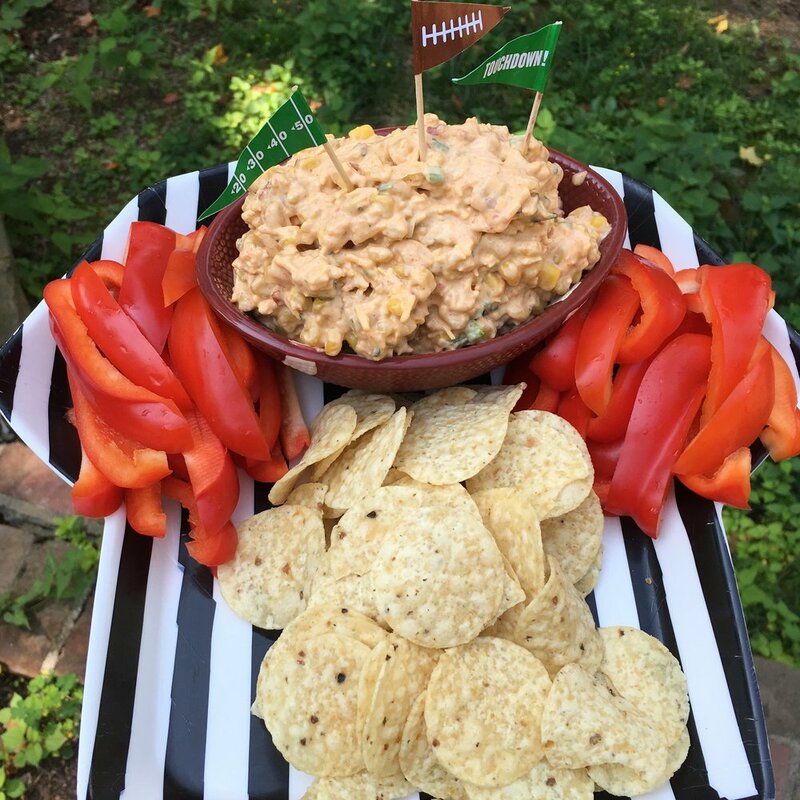 Needing an easy yet tasty dip for kick off weekend this year, I went through old recipes and found this LSU Tiger Dip. Just as she promised, it's delicious. Switch out the name and serve to your fans. They'll love it! 2 sprinkles of red pepper flakes-- or more for a kick! In a large serving bowl, stir together the corn, mayonnaise, sour cream, green onions, cilantro, Cheddar cheese and lime juice. Season with cumin, cayenne pepper and salt. Stir to blend in seasonings, then refrigerate until chilled before serving. Nanette from LSU says they "always share this dip with fans from opposing schools in an effort to help soothe their impending loss! We've met more fun people from other schools over food and drinks. Some have even returned each year to tailgate with us!" It seems that each year the pumpkin craze starts earlier and earlier. I'm grateful that we made it through Labor Day without seeing a pumpkin spiced anything... but now it's time. Pumpkin has assumed its position on the throne for the remainder of the fall. Not always a huge fan of the pumpkin everything trend, these to-die-for Pumpkin Carob Chip Cookies changed my mind. Not to mention, I tweaked the original TheKitchn recipe and made these organic with all good for you ingrediants. And Carob chips so I could snack on them before bed without any caffeine from chocolate! Serve these with coffee at a breakfast tailgate or serve them as a sweet treat anywhere you need a fix. These certainly please the masses and don't add any weight to your... well... it rhymed. Below is the recipe with my updated organic tweaks. It's easy, delicious and healthy! Preheat oven to 375°F. Spray non-stick baking sheet with organic coconut oil (or whatever "Pam" type spray you have). Melt butter (microwave or stove top) until the butter liquifies but doesn't melt completely. Use fork to stir until all solid butter is gone and let it cool. In a large mixing bowl, combine the butter, brown sugar, and coconut sugar. Mix with a wooden spoon until the mixture is smooth. Add the pumpkin purée, egg, and vanilla, and stir until blended. Add the flour, oats, cinnamon, baking soda, and salt, and mix until almost combined, with a little bit of flour still visible. Fold in the carob chunks. Roll mixture into 1 inch balls and place on baking sheet. Space cookies approx. 1.5 inches apart. Bake the cookies for 16 to 20 minutes, until light golden-brown, but still a little soft-looking on top (err on the side of underdone; do not overcook, as the cookies will continue cooking while cooling.) Use middle rack to prevent burning on the bottom. Remove cookies from the oven. Let the cookies cool on the baking sheet for 10 minutes, and then transfer to a wire rack or large platter for another 4 hours to allow the cookies to completely set and develop their flavors. Repeat with the remaining dough. These treats will stay moist and ready to eat for up to a week when properly stored in an air-tight container! This recipe is from TheKitchn. For more healthy recipes, visit their site to be amazed. Please send in your tailgate recipes and go-to game day spread ideas. We love to know what you're eatnig on Saturdays! Serious Football: The Xs of "Xs and Os"
It's painfully close. We know. In fact, by now you should have your opening weekend menu and outfit planned and your bags packed! Yes, looking good and have a great spread are principal elements to our Southern football. However, as a Gridiron Belle, you know the game is just as important as the party. So here is the "Xs" portion of "Xs and Os." Defense wins champions. Study up! The goal of the defense is to tackle the man with the ball and prevent the offense from running, passing, or kicking the ball over the end line. The defensive line consists of four linemen, two ends and two tackles, who line up directly across from the opposing O-line. Defensive line from left to right: end, tackle, tackle, end. The defensive end’s main purpose is to contain the running backs to the inside on running plays, or to rush the quarterback on passing plays. Tackles are responsible for stopping the run up the middle and for engaging the offensive linemen so that the linebackers can move toward the ball without opposition. This player is also known as the nose-tackle. Depending on the defensive scheme (line up), “odd man fronts” will have what is called a nose-guard. This player lines up directly over the football (his nose is over the ball). Linebackers’ goal is to stop the run, defend against passes, and sometimes, to rush the QB . Linebackers are usually faster than defensive linemen and are larger than their defensive teammates. Secondary is the area of the field deep that is off the line of scrimmage (way in the back) where defensive backs (cornerbacks and safeties) are strategically placed to defend the run and pass. A defensive back, who is usually responsible for covering wide receivers. A safety is the last line of defense and is extremely fast and aggressive. Safeties are found deep in the defensive secondary (way in the back) and help the cornerbacks with pass coverage. The season is getting so close we can almost taste the buffalo chicken dip; we can practically smell the aroma of crisp fall air infused with bourbon hovering SEC tailgates, and what was that? You heard the collision sound of pads and helmets, too? With just days left before the highly anticipated season arrives, it's time to send fluff home and get technical about serious football. Today we are breaking down the Xs and Os of our beloved game-- well, just the "Os". In case you took the summer off, this will be your refresher course so that next Thursday, Friday and Saturday you'll be fully primed to understand the players on the field. The goal of the offense is to run, pass, or kick the ball over the end line or through the goalpost/up-rights to score points. 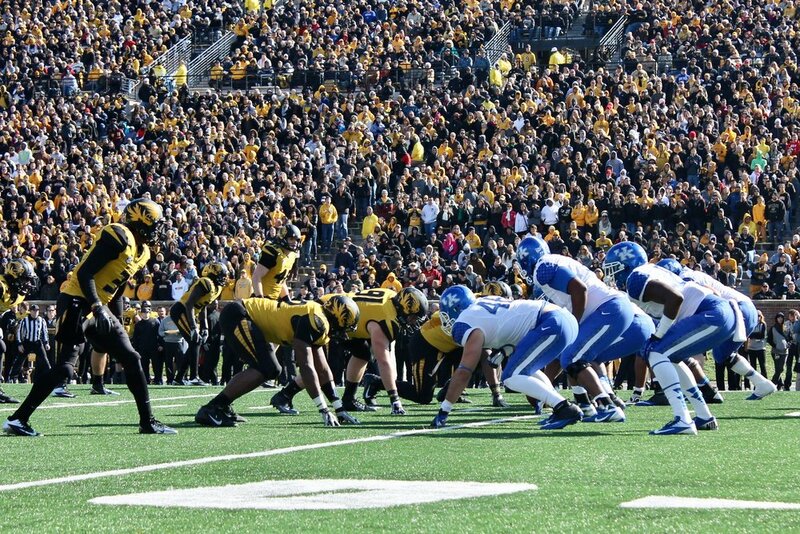 Offensive Linemen: The “O-Line,” consists of the players on the line of scrimmage. Their goal is to protect the ball-carrier while simultaneously creating gaps on the field where the ball-carrier can safely run through the opponent. The offensive linemen are the big guys. The play starts with the center snapping the ball (passing the ball through his legs) to a teammate. Once he snaps the ball, he begins to hold off the oncoming opponents. The guards do what it sounds like: They guard the quarterback, or whoever has the ball, from the opponent. Two offensive tackles try to block the opponent before he gets to the quarterback, or the player with the ball. Tight end is a hybrid position between offensive lineman and wide receiver who is supposed to have the dual abilities of blocking linemen and receiving passes. A wide receiver’s primary responsibility is to catch passes. He is wide in the formation and receives the ball. The fullback either blocks for the halfback so he can run down the field, or the fullback blocks so that the quarterback can make an uninterrupted throw down the field. The halfback lines up in the offensive backfield behind the fullback and the quarterback. The halfback primarily runs the ball during running plays and can also be used as a wide receiver. The quarterback takes the snap (receiving the ball from the center), and he can choose to hand the ball to the running back, pass the ball to an eligible receiver, or run the ball himself.